Some professors begin the first lecture of the year with a warning to their classes: "Don't be the student whose parents contact me." This is usually accompanied by a story of one such unfortunate student. The story itself is a secondary warning that, if your parents do contact your professor, you will be the subject of Poli Sci 101 ridicule for the next 20 years. As the room fills with nervous laughter, it is easy to distance yourself from these blameworthy students. Probably like everyone else, I never thought helicopter parenting would happen to me. 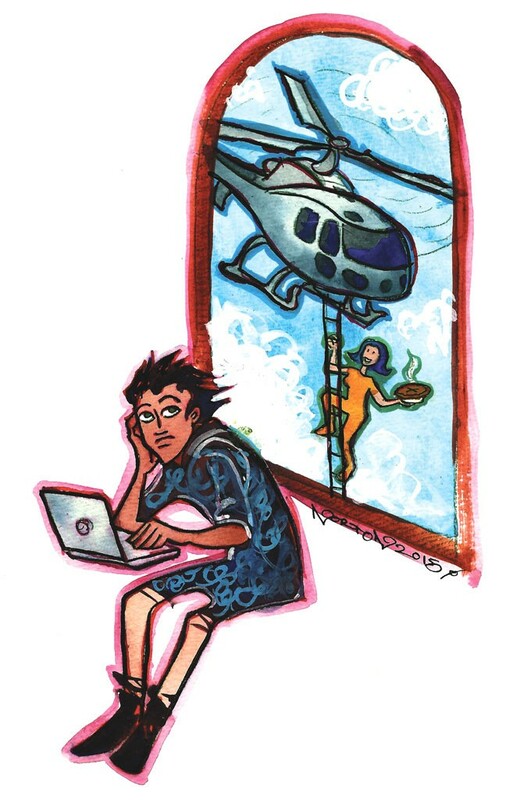 The term "helicopter parenting" represents fear to some and a punch line to others. Over-involved parents are everywhere, from the mom who yells at a mortified second-grader playing shortstop to wear his athletic cup to the dad who calls up his 24-year-old offspring's boss to demand a raise. It's easy to laugh — until it becomes your reality. While most parents have their child's best interests at heart, the overstepping of personal and professional boundaries are hallmarks of the formidable helicopter parent. When you're in college, away from home for the first time, the rotors really start spinning. I had no idea what I was doing when I entered college, like the vast majority of freshmen. While I did well enough in my classes grade-wise, they were a rather random assortment of studies that I chose for their availability rather than my intellectual desire. Such is the life of a first-year student at a small liberal arts school. But I was pretty sure I could figure it out on my own. My mother was never going to call my professors. Like any good young man who was raised in all-American suburbia, I made sure I called my parents every week. OK, I texted them sometimes, and maybe they had no idea if I was alive during the month of October. But as I tried to navigate a world of new experiences and responsibilities, I listened to my parents' advice, even if I sometimes ignored it. Our phone conversations touched on standard things: life at home, how the dog was doing, my attempts to make new friends, how laundry works, my academic pursuits and a slew of other issues. While I was undergoing the typical college-freshman soul searching, my academic wanderings were a lot more concerning for my mother. One evening, as we talked about the merits of signing up for this class or that, she got fed up with my indecision and announced, "Well, I'll just call your adviser and see what he thinks." Oh, no! This was exactly what I had been warned about. My pulse raced. Worst-case scenarios flashed before my eyes. I felt like Arnold Schwarzenegger yelling, "Get to da choppa!" in Predator. How many professors had my mother already contacted without bothering to tell me? Maybe all of them! She probably sent them baked goods and my high school senior photo so they would remember my face. I imagined tenured professors sipping locally roasted coffee as they chortled at the young Lynch boy whose mother emailed about an extension, argued a grade or asked if I seemed to be getting along with my classmates. My adviser, the very professor my mother wanted to contact, would react especially poorly. I imagined him sitting at his desk, working though his emails, reading my mother's plea for help. He is not really the computer type, nor the ask-mother-for-help type. He is more the I-was-on-the-Oxford-boxing-team, my-drive-to-the-lane-is-savage, I-take-care-of-myself type. Surely he would spit out the tacks he'd had for breakfast as he read, "Hi, Dan, my name is Barb, I am James' mother." I was going to look softer than a Pillow Pet, the intellectual equivalent of undercooked raisin bread. I blurted out, "No!" to my mother as quickly as I could, but I knew it wouldn't be enough. "No" was a mere diversion for a helicopter parent. I was the awkward and gangly matador sidestepping a charging bull. (Though, in fairness, this bull is incredibly caring and makes a delicious spinach quiche.) I had to do more. After convincing my mother that I would determine what classes to take by myself, I put my best effort into figuring out how to avoid her helicoptering in the future. If my mother was frustrated by my indifference and limited knowledge, I would give her as much as I could. From that point on, I began to share with her enough information to bore a Supreme Court justice. If she wanted to know what was going on, I told her. It would not suffice to say my Greek history class was "great." Instead, I described in great detail the heroic escape of Arion upon the backs of wild dolphins. While my mom was on her lunch break, I gave her my analysis of the 73rd Federalist Paper and the veto power of the executive. I told her about every new friend, every class, everything. I gave her helicopter a turbulence of information it could not handle. On one phone call, to see just how uncomfortable I could make her, I told my mother about a job listing for an alligator wrestler on craigslist. The position "had always been a dream of mine," I told her. I eagerly awaited hearing her concern, gleefully anticipated her squirming. But all she said was, "Yeah, just be safe, James. Thanks for letting me know what you are doing." What? OK, I thought the job sounded cool, but I told my mother about it to scare her, more than anything. I didn't know what to say. I wasn't even sure I wanted to wrestle alligators. The prospect of waving hello with three and a half fingers for the rest of my life just didn't seem all that great. My mother was being unbelievably cool. She didn't call my professors or question my judgment. She seemed to trust me and let me do what I was interested in doing. It was almost as if ... what she wanted all along was for me to take responsibility. Though I didn't pursue the alligator-wrestling job, my mother did not object when I pursued other questionable activities: guiding treks in the mountains of New Mexico, canoeing to New York City, studying abroad in Amsterdam. My mother had turned from a helicopter parent into a just-tell-me-what-the-heli-is-happening-in-your-life parent. Perhaps I will suggest that my professor start his next freshman class not with a lecture about avoiding phone calls, but rather with one about making them: "Call your parents," he could say "They're probably pretty cool." James Lynch is a senior at Middlebury College. The original print version of this article was headlined "Parental Advisory"